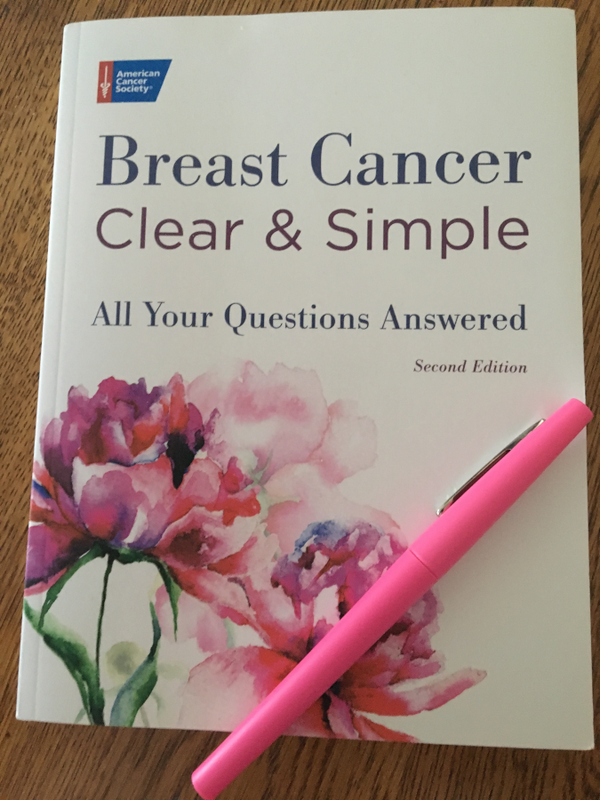 If you have recently been diagnosed with breast cancer (or if someone you love has), I’d love to tell you about a wonderful resource the American Cancer Society has made available, Breast Cancer Clear & Simple. All of your questions are conveniently and clearly answered in this one convenient guide. The fact that it’s from The American Cancer Society makes it the first, and possibly even last, guide you need at this time. No one will have the up-to-the-minute information that this organization has. The American Cancer Society is a grassroots organization committed to fighting cancer through balanced programs of research, education, patient service, rehabilitation, and advocacy. Its goals emphasize prevention, early detection, and screening; comprehensive treatment information; answers to questions about insurance, money, and planning for the future; and strategies for coping with the physical symptoms and emotional effects of cancer. The organization is based in Atlanta. … It’s normal to be upset and confused. You have a lot of questions, and you need answers to them – now. Choose the right doctor and ask the right questions. Understand your options after diagnosis. Deal with the effects of treatment. Determine the pros and cons of breast reconstruction. Find out about support groups. This book will provide you with the clear and honest answers you need to make the choices that are right for you. Breast Cancer Clear & Simple is must a have weapon for anyone who finds themselves in this particular battle. 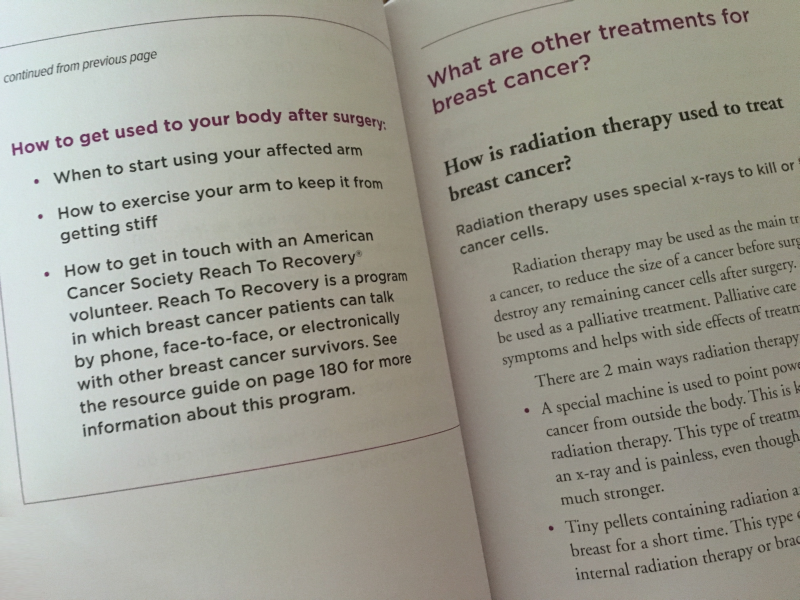 I love the wealth of information The American Cancer Society has made available within the pages of this book. They’ve covered every conceivable concern a cancer warrior (I refuse to say victim – you’re stronger than that!) would face. I love the size of the book, too. It’s smaller than your average book, making it IDEAL for carrying in a handbag or backpack. You’ll want to keep it with you most of the time and the size makes that possible. I think, more than anything, I love that it was written with guidance from breast cancer survivors – warriors who stared down the enemy and won! They’re now helping the American Cancer Society give others a battle plan. I cannot think of greater experts than those who have walked the walk. 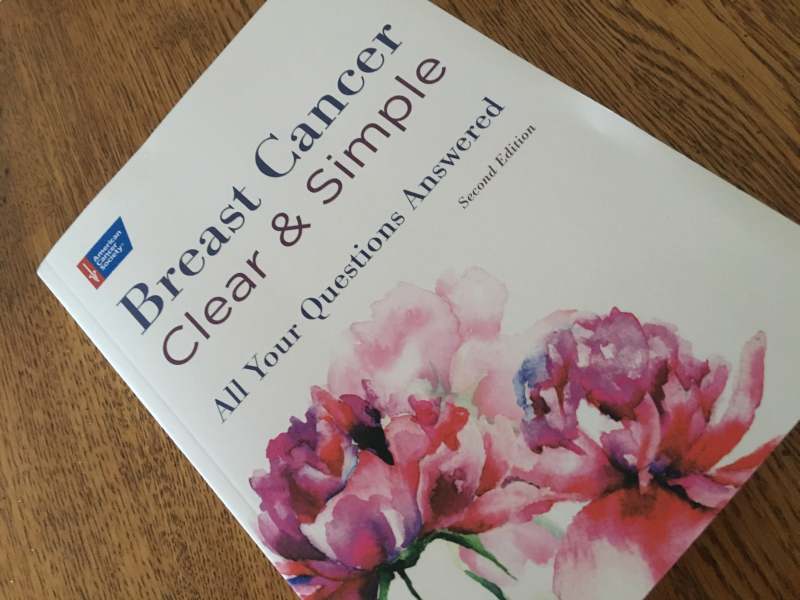 You can find your own copy of Breast Cancer Clear & Simple on Amazon – available in paperback and for Kindle. I was sent a copy in exchange for telling my Self Help Daily readers about the book and I will be thrilled to send it (completely free of charge – I’ll even pay shipping) to the first person to e-mail me about the book. You can either request it for yourself or for a loved one. I’ll put it in the mail immediately. See Also: Find many more resources, support, and information through the American Cancer Society.